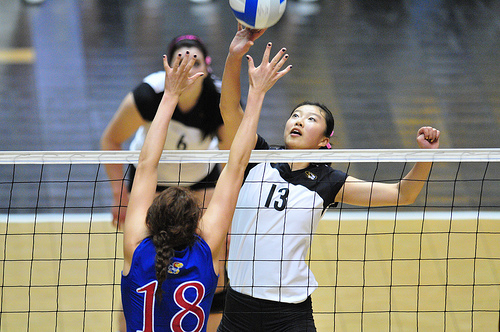 The middle blocker volleyball position is the first line of defense when the opposing team attacks. 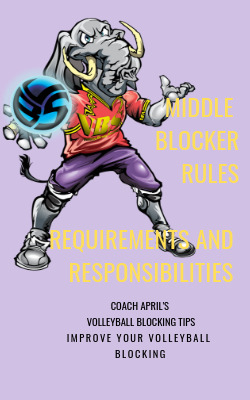 The middle blocker volleyball position, here's what you need to know. 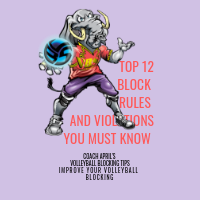 Let's say your coach hasn't established any specific blocking strategies in the game plan, then the area of the court that you decide to take away from a particular hitter is determined by the indications you " read" or "see" and what you have noticed about that opposing hitter's tendencies. Of all the volleyball positions middle blocker is the one that needs to remember the most, what an opposing player has done effectively when attacking during the match. If you're a middle blocker you want to keep that information in your mental toolbox and pull that information out to use when you go up to stop an attack hit at the net. You might be thinking ..."Okay here she comes again, what did this chick do last time she hit that type of set? Oh, that's right she tried to hit cross court on me. The last time she did that I could tell because she really opened up her hips during her spike approach towards my cross court. If she does that again I know she's probably going to hit cross court again. I'll be ready for her this time!" 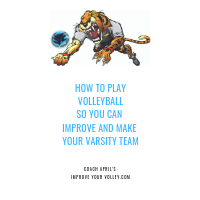 You need to remember how and where a hitter has been able to score points against your team during a match, so you can help form a plan which stops the hitter from being so effective. 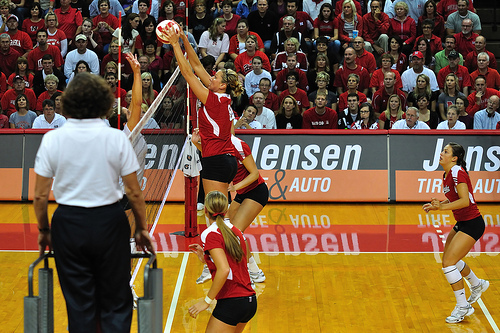 Once you've decided which area of the court to take away from the hitter, stick with your plan! You don't want to block an area then go chase the ball in mid air with your arms flailing above your head in an attempt to try and cover another area. 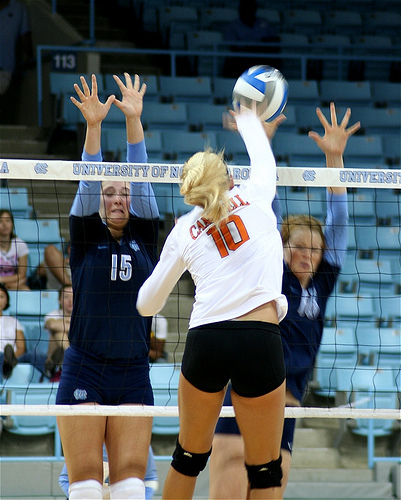 You can't block everything at the net. You have to stay focused and disciplined and follow through with what you said you were going to do or what the Coach told the team to do. 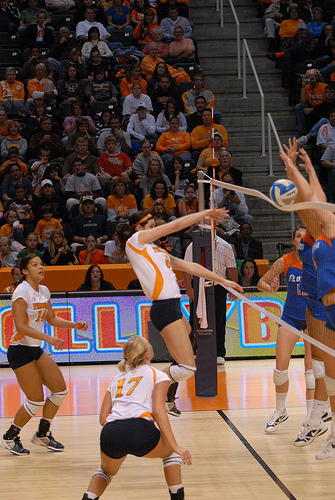 If you are going to block a certain hitter cross court then you need to do that even if in the middle of her hit she shows you something else. 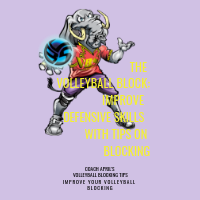 Your attempt to take away everything, really means that you haven't decided on any specific part of the court to take away from the hitter with your block, so in the end you will be taking away nothing. You will just give the hitter a target to hit at with your hands. 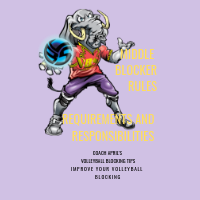 The Middle Blocker Volleyball Position - As a blocker in volleyball remember that you just can't cover everything at the net because the front row defensive players are working together with the back row defensive players. 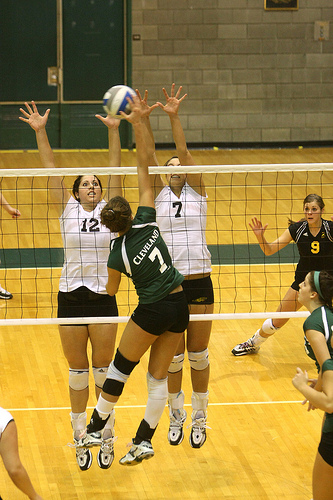 As a blocker in volleyball remember that you just can't cover everything at the net because the front row defensive players are working together with the back row defensive players. If the front row is taking one area of the court away, then the back row is depending on them to follow the game plan and to do that in each rally until the coach decides to change the game plan. What Areas Along The Net Can The Block Take Away? Basically, you can take away three things from an oncoming opposing hitter. You can take away their line hit, you can take away their cross court hit or you can take the ball. When you set up early and take only one area, whether cross court or line, then your back row players on defense will be able to understand easier and faster what other areas of the court to cover behind your block. If you are a blocker in volleyball at the net trying to take everything away, then your back row teammates don't know where they need to position themselves in defense behind you. 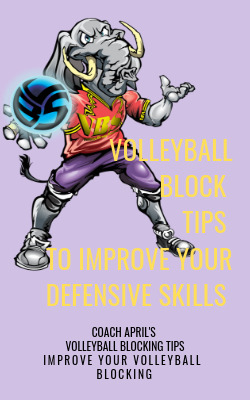 Learn more about the Middle Blocker and Blocking in the Related Links Below. Or visit the Volleyball Position pages in the section in the drop down menu at the top of the page.